Wonder dog Sampson here! Sampson Amadeus to be exact, but you can call me 'Sana Man', 'Sampy' or 'Toochie' if you wish. 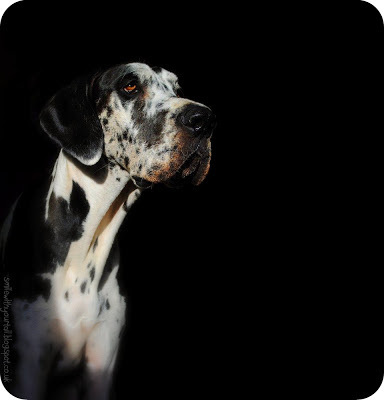 I am a harlequin Great Dane born in Derbyshire on the 25th April 2011. I am the perpetual pup, Mum says I will never grow up, but where is the fun in growing up? I am a rather large doggy and most of the time I simply don't know how big I actually am, so I am always falling over Mum, my siblings, chairs, my own feet etc etc. I get up to lots of trouble, mischief...adventures, so Mum tries to write about them, because sometimes day to day life can be quite interesting with a giant breed like me.